This post explains how I choose between Evernote Notebooks and Tags to organize my notes. New to Evernote?…check out my introduction to Evernote. Do a search on Google for Evernote and Notebooks or Tags, and you’ll come across a minefield of posts on blogs and in user forums from enthusiastic Evernote users all debating touting their particular system and reasoning for that system. Well, you can now add this blog post to that list of search results. This post wasn’t even in my plan for this blog series, but a commenter on the last post specifically asked about my system, and (due to that same post) a colleague and I had an ensuing Twitter conversation about this topic. So I decided to weight in on this discussion. I’m a librarian, so I over-organize my life. I can’t help it. It’s both a gift and a sickness. I regularly revisit — at least a couple of times a year — how I categorize things on my blogs, in my Flickr channel, in my Diigo bookmarks, in Gmail and Outlook, in my Facebook photo albums, etc. And yes, in my Evernote library. In fact, after the last blog post and discussions, I went back into Evernote and fine-tuned my note classifications even more. Like I said…it’s both a gift and a sickness. I use my Notebooks and Notebook Stacks to hold broad groupings “containers” of related Notes. I use Tags to apply descriptive topic words across my entire collection of Notebooks and Notebook Stacks, so that I can filter (browse or search) on just a particular topic “Tag” or group of Tags at a time. Sharing some examples should help explain this better. All notes pertaining to my library’s website get Tagged with “LibWeb”, yet those notes live in various Notebooks: Notebook “Work: Pollak Library” holds the bulk of those notes (meeting notes, action items, etc.). However, snippets of code that I want to remember for our website live in Notebook “Tech: Code”, and articles that I have researched and saved highlighting web design issues I apply to our website live in Notebook “Research: Web”. All of my personal Bible reading notes go into my “Discipleship: Bible Notes” Notebook. Yet I apply the “Bible” Tag to any note that has anything to do with the Bible — this might include sewing patterns for Bible covers (in Notebook “Crafts: Sewing”), notes taken during church worship services (Notebook “Discipleship: Sermon Notes”), cheat sheets or articles for my favorite Bible apps (Notebook “Tech: Tools”), etc. All of my clipped recipes go into a “Food: Recipes” Notebook. Yet all of those recipes are Tagged with descriptions like “Mexican”, “kid-friendly”, “tried and liked”, “tried and didn’t like”, “week night”, “slow cooker”, “Christmas”, “easy”, etc. Again, these are all Tags on which I quickly want to be able to filter (search or browse) when looking for a particular type of recipe, and when compiling our weekly menus. All notes that have anything at all do with Mexican culture get Tagged with “Mexican”. Yet, those notes live in Notebook “Food: Recipes” if the note is a recipe for a Mexican dish, in Notebook “Food: Misc.” if it’s a clipped review for a Mexican restaurant I want to visit, in Notebook “Research: Genealogy” if it’s an article about researching my Mexican ancestry, or in Notebook “Personal: Home” if I’ve clipped a photo of some Mexican-inspired cookware and kitchen linens I want. Using a “Meetings” Tag, I can quickly access meeting agendas and notes from any Notebook — whether it pertains to work, church, or one of my professional associations. 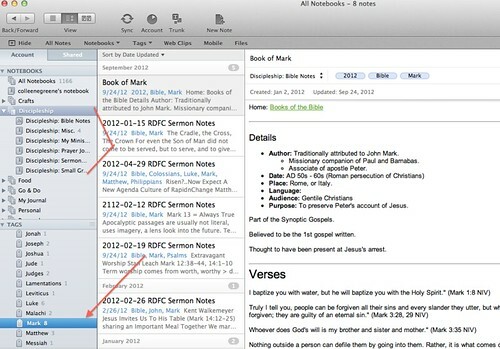 Filtering on the Tag named “Mark” I can quickly retrieve all of my church and Bible (aka Discipleship) notes that pertain to the Book of Mark or to the Apostle Mark. Retrieving all notes flagged with the “kid-friendly” Tag shows notes scattered throughout various Notebooks for recipes and vacation ideas. A “kid-friendly Notebook just wouldn’t make as much sense. 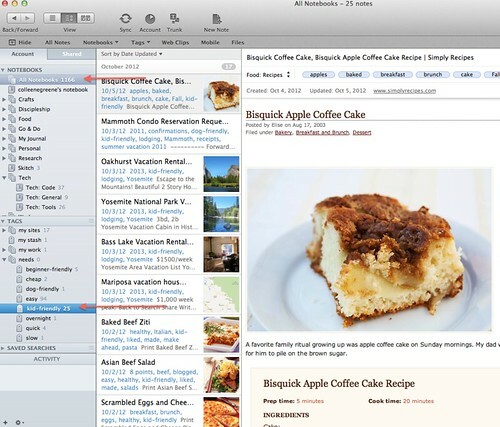 Retrieving all notes flagged with the “Mexican” Tag shows notes scattered throughout various Notebooks for recipes, genealogy, etc. A Notebook titled “Mexican” just wouldn’t work right. Aside from descriptive organization, I keep functionality in mind when choosing Notebooks or Tags. Notebooks can be shared; Tags cannot. A friend recently asked me to share the template and methodology I use (a future blog post) to capture and organize all of my Bible study notes. Since I store all of these notes in my “Discipleship: Bible Notes” Notebook, I could simply share that entire Notebook with him for his review. I cannot share my “Bible” Tag with anyone. Notebooks can be accessed off-line (Premium accounts); Tags cannot. As a genealogist and local historian, I spent quite a bit of time visiting archives and trying to capture family history information when I visit relatives. Many archives are buried in parts of the building that don’t have good wifi, and some of my older relatives don’t have wifi or Internet at all. My iPad is wifi-only. I need to be able to access certain notes even when off-line. I can choose to make my “Research: Family History (Colleen)”, “Research: Family History (Jeff)”, and “Research: OC Fallen Heroes” Notebooks available for off-line access so that I can access notes in those anytime. If I just went with one jumbo “Research” Notebook, I’d have to make that entire Notebook accessible off-line, which would take up much more actual storage space on my already very full iPad. And since one cannot designate particular Tags for off-line access (i.e. “my family history”, “Jeff’s family history”, “Robledo” surname, “Greene” surname, etc.) I have to use Notebooks to fine-tune that level of off-line access. This whole system becomes even more efficient when combined with Saved Searches, but that’s another blog post. 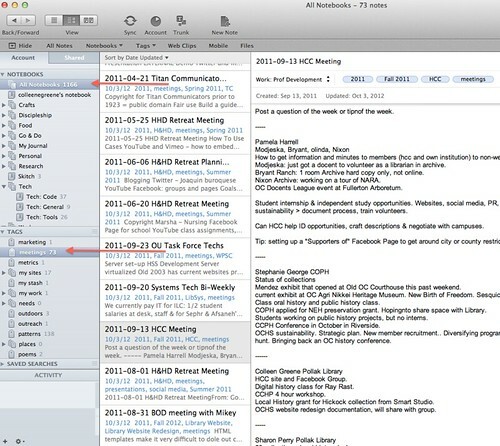 What organizational system works best for your Evernote library? 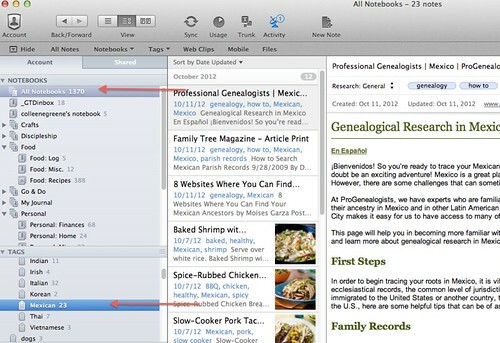 I’m relatively new to Evernote and your blogs have helped immensely in learning to use it in my genealogy work. I’m at least starting to understand your organization system and have patterned my system using what I need which makes sense to the way I work. Thank you so much for sharing. Now to the question. When I create a new tag I sometimes can not remember which nest I put similar tags into. For example, when tagging a note with a new cemetery, did I put previous cemeteries in my “Places” nest or my “Organizations” nest. How do you consistently get them in the same nest? lol! I ended up a teacher, but came very close to majoring in library science. I, too, over-organize everything and enjoy every minute of it!